A silly but enjoyable monster movie written by JJ Abrams (the creator of Lost) and directed by Matt Reeves, Cloverfield stars Mike Vogel, T.J. Miller, Jessica Lucas, Lizzy Caplan, Odette Yustman and Michael Stahl-David as a group of young twenty-somethings in New York who, while attending a going-away party, become the unwitting observers of a catastrophe when a huge monster of indeterminate origin begins attacking the city. The film then unfolds in pseudo-documentary fashion, as video taped on a hand held camera by one of the group, as they make their way across the increasingly devastated downtown Manhattan, trying to make their way to safety. 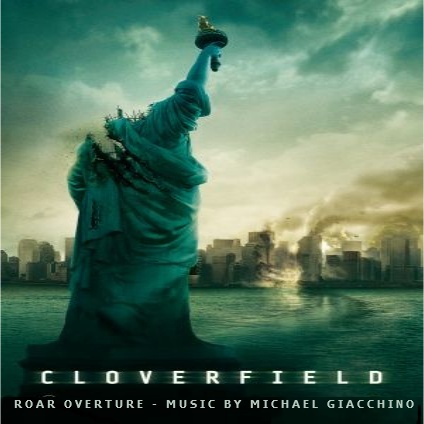 To enhance the sense of realism, Cloverfield has no original score in the film itself: the only music comes by way of source material heard at the party, or elsewhere as the characters pass by places playing songs. Michael Giacchino’s contribution, therefore, is limited to a 9-minute ‘overture’ entitled “Roar!”, which plays over the end credits.